The music, the food, the art - the New Orleans Jazz and Heritage Festival is one of the most popular, annual events that takes place in the city. We've put together a Solo Traveler’s Guide to Jazz Fest Guide with helpful hints, safety tips, and food and drink recommendations. Photo by sailn1 via flickr. Jazz Fest is the New Orleans Jazz and Heritage Festival. Other cities have jazz festivals, but there is only one true Jazz Fest. The Fest is a daytime only event, with the first acts beginning at 11:15 a.m.
Jazz Fest has 6 large stages plus 5 tents hosting almost a hundred different musical acts each day. There's also fantastic food, as well as crafts, art, parades, cooking demonstrations, and more. Where is Jazz Fest held? 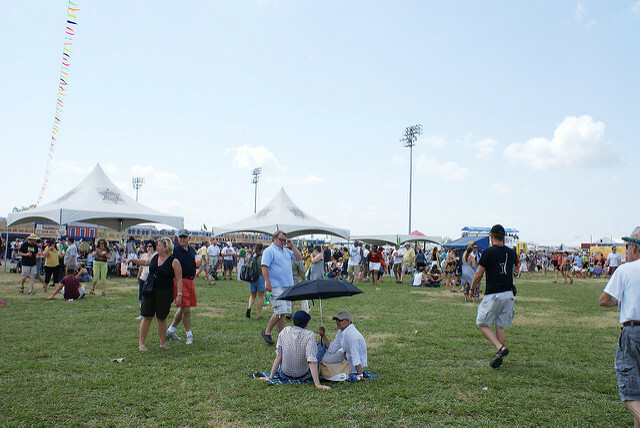 Jazz Fest is held at the the New Orleans Fair Grounds and Race Course, an historic horse racing track in New Orleans. The Fair Grounds is located in New Orleans' Gentilly neighborhood, about 3 miles northeast of the French Quarter. Photo by Rebecca Nelson via flickr. When is Jazz Fest held? 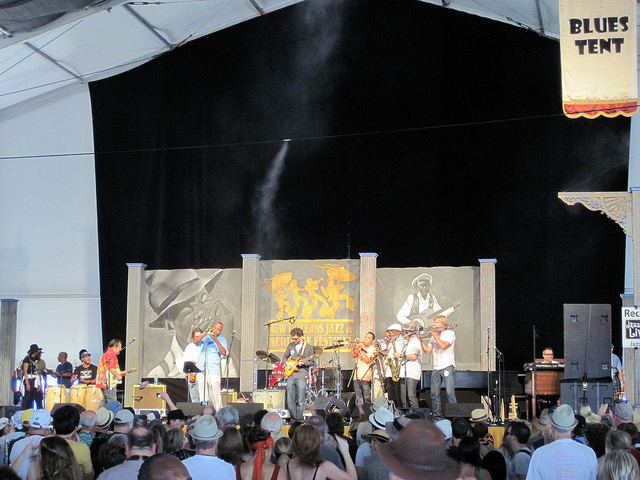 Jazz Fest is held each year over a consecutive three-day and four-day weekend - generally the last weekend in April and the first weekend in May. The first weekend runs Friday thru Sunday, and second weekend runs Thursday thru Sunday. For 2018, the dates were April 27-29, and May 3-6, 2018. Gates at the Heritage Festival open each day around 11:00 a.m. The first bands start at 11:15 and the last bands play until 7:00 or 7:15 p.m. 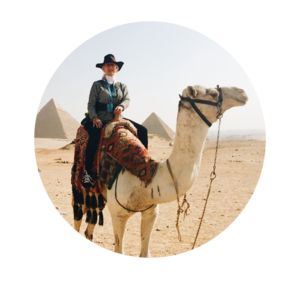 While there's certainly no shortage of fantastic jazz - both traditional and contemporary - the music includes almost everything: rock, blues, jambands, gospel, soul, reggae, big band, R&B, country, and more. While there's no classical or opera, and no electronic dance music, you'll surely find everything in between! Who performs at Jazz Fest? To see the full lineup at the 2019 Jazz Fest, click here. This year's headliners include the Rolling Stones, Santana, Diana Ross, Earth Wind and Fire, Jimmy Buffett and Alanis Morissette. All your favorite regulars will be there too! Including Trombone Shorty, Marcia Ball, Irma Thomas, The Dirty Dozen, Rebirth Brass Band, the Preservation Hall Jazz Band, Tab Benoit, Cowboy Mouth, and many performances by the members of the Neville, Marsalis, and Batiste families. There are 5 large stages located within the racetrack infield. The Acura Stage, located at one end of the racetrack oval, is the biggest, and this is where the biggest headliners perform. Crowds get pretty big here. 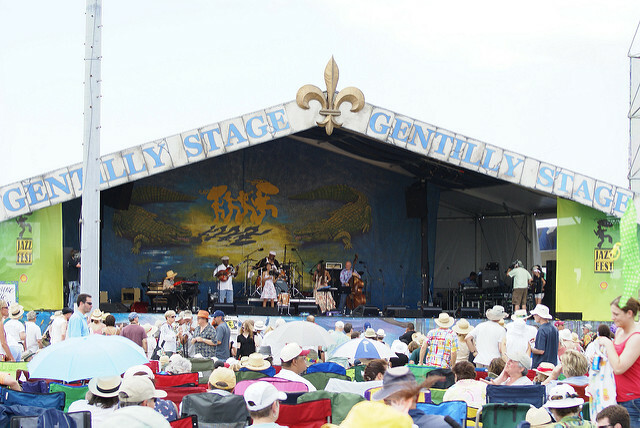 The Gentilly Stage is the next largest, at the other end of the oval. A wide variety of musical acts perform on both the Acura and Gentilly stages. The Fais Do Do Stage acts are mostly South Louisiana acts, and features Cajun and Zydeco acts, plus some bluegrass and folk. The Congo Square Stage acts seem to be African or Caribbean influenced; soul, rap and hip hop bands play here as well. The Jazz and Heritage Stage features brass bands and Mardi Gras Indians. Photo by djnaquin67 via flickr. The audience area at each of these stages is basically just a big open field. For the most part, it is all dirt, except for the Gentilly stage, Congo stage and the rear of the Acura area, which are more grassy. If it rains, these areas will get muddy. Many festival goers bring chairs and blankets to sit on. We recommend that you get up and dance! There are also some large bleachers at the back of Acura and the track-side of Congo which is first come, first served. There are also 5 tents that host acts. The Jazz tent, the Gospel tent, the Blues tent, and the Kids tent are pretty self-explanatory. In the Economy Hall tent, you'll hear New Orleans-inspired traditional jazz, ragtime and Dixieland. Unlike the big stages, the tents are covered from the sun, and are filled with aisles of folding chairs, auditorium style. The tents will seat from several hundred to a few thousand, but do fill up for popular acts. If you're looking to escape the crowds for a little while, head to the Lagniappe Stage, which is through the grandstand, in a courtyard on the ground floor. There's even some shade there. Upstairs inside the Grandstand is the Alison Miner Music Heritage Stage, which hosts interviews with selected performers. The grandstand building also hosts cooking demos at the Food Heritage Stage and at the Zatarains Stage. Blues Tent. Photo by sailn1 via flickr. Most acts play between 50 and 75 minutes. The headliners might play longer, perhaps an hour and a half up to two hours. The schedule is strictly followed so you'll notice that each act will be off the stage within a minute or two the scheduled end time, no matter how loud the screams are for another encore. There is a 20 or 30 minute change-over time until the next performer comes on, which helps keep the schedule from falling behind. The Weather: Hot, Humid and a chance of rain! It'll be hot and humid! Expect afternoon high's in the low 80's. Occasional brief showers, with more rain occasionally. The fest is rain or shine, with cancelled days about once a decade - which happened two years ago! Have your rain boots ready!! Think cool and comfortable. Breezy dresses, comfortable sandals, and a floppy hat are a must. Expect to do lots of walking and standing, so comfortable shoes are a must. Don't forget to pack sunscreen, and have the rain gear ready just in case! Two most important things you can bring to Jazz Fest are comfortable shoes and cash. Be prepared to walk, and be prepared to spend money. There are ATM's inside the festival grounds, but expect lines and a surcharge. They do allow you to bring in one factory-sealed bottle of water, up to 1 liter. Keep it sealed until you get inside. No other outside beverages will be allowed. Bring a camera. Digital cameras are fine but videocameras are not allowed. If you plan to spend most of your time at one stage, or if you're part of a big group, bring a blanket or tarp to sit on. Lawn chairs are okay too. When you set up camp, try to leave a foot or two walkway between you and your neighbors. People will need to get by! Photo by Nicolas Henderson via flickr. If you are attending Jazz Fest with a group, the first thing to do is to decide on a meeting place and times. Even if you try to stay together, it's easy to get separated. Prepare for this chance and decide when and where to meet! "The arch at the back of the Congo Square stage area. You can listen while you wait. "The storytellers stage in the Louisiana Folklife area, between Congo and Fais Do-Do. Sit under some of the only shade trees in the Fairgrounds and relax. Many folks meet at the flagpole at the center of the Fairgrounds. It's central and easy to find, but as a popular meeting place, it may be crowded after a set ends at one of the big stages. Cell phones are a great, but don't always count on them as service does get spotty. Just remember, it will get crowded. Everyone is there for the same reason as you, to have a good time. If the crowds get too thick during a performance, just move back. You can hear the bands at the big stages (Acura and Gentilly) fine, even from the far end of the lawn. Gentilly Stage. Photo by djnaquin67 via flickr. Stash cash, credit cards and any currency. Buy your ticket ahead of time so you aren't carrying wads of money. You'll need some cash to pay for eats, as most Jazz Fest food booths don't fuss with credit cards. Keep one credit card with you for emergencies. Carry cash in uncommon places and leave the rest at home with your checkbook, valuables and expensive jewelry. Don't make yourself vulnerable. Stay near groups of people if you're alone. Dress down so you don't look wealthy. Don't carry a camera draped around your neck. It makes you look like a tourist and an easy mark. Don't carry a purse with a long strap, don’t wear mardi gras beads or a lanyard. Use your cellphone. Put a tracker app on it in case it's stolen. Let people know where you'll be. Text if anything looks suspicious. Identify safe places and people. Note where police officers and security personnel are stationed. Keep an eye on them. There are two First Aid stations near the Gentilly Stage and Acura display. The police kiosk is next to the Gentilly Stage also. Information booths are near both. In weather-related emergencies, stay away from large portable structures like tents or stages. Keep away from electrical wires, sound systems and equipment. Locate the storm shelter. Enjoy this short video showcasing the headline music acts that will be performing at Jazz Fest 2019. For more useful information, such as how to get to and from New Orleans Jazz Fest and what to eat and drink there, check out the blogs below!